I have always had a special fondness for Doodlebugs. They are linked to some of the happiest memories of growing up because of my Grandpa. He lived in Versailles, Missouri, which was served by the Rock Island Railroad. Trains 23 and 24 were the daily passenger service between Kansas City and Eldon, Missouri. These trains were not the grand streamlined Rockets. They were Doodlebugs. I probably had my first ride on one of these Doodlebugs when I was only a few months old, but I don’t remember those early trips. (I was very young at the time.) Since Dad worked for the Rock Island, we always traveled by train and Mom would get on the Doodlebug in KC and take me to see my grandparents. Every summer starting when I was four years old, I got to spend a couple of weeks with Grandpa in Versailles. He taught me how to make a slingshot and shoot it. He let me help him clean the movie theatre every morning and I got to keep any loose change I found. And always the trips to Versailles started with a trip on the Doodlebug. My first solo trip took place when I couldn’t have been more than five. Dad took to me to Union Station and introduced me to the conductor. He was told where I was going, who was to meet me and to keep me on the train until we got there. I do remember those trips well. One of the highlights was the thrill of walking down the aisle to the water cooler, pulling the paper cup from the dispenser and getting a drink. I was probably responsible for the decimation of a small forest as I used up many paper cups each time. The Doodlebug stopped in every small town between KC and Versailles. It dropped off and picked up mail, packages, and people. It was the UPS truck of its time. I remember them unloading cardboard cartons of baby chicks, tomato plants, onion sets, and seed potatoes among other things. I am sure that to grownups the trip seemed long and slow (119 miles with 18 scheduled stops plus several flagstops in 3 hours and 20 minutes), but to a kid on his way to spend time with Grandpa, there were so many things to see at each stop that the time seemed to fly past. When Bachmann released a doodlebug a few years ago I had to have two of them. One was in the Rock Island livery since this was a part of those childhood memories. 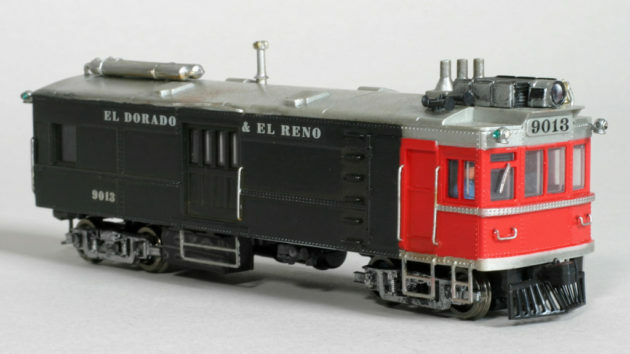 The other was undecorated, and the plan was that it would eventually receive some modifications and serve the El Dorado and El Reno Railroad, a freelanced railroad my wife and I are building. The undecorated version was one of those “get around to it” projects until June of 2004 when Jim Providenza was in St. Louis doing clinics for the Mid Continent NMRA Regional Convention and operation on the El & El. One of the trains on the El & El’s schedule is called the Schoolbug. It runs from Caddo Gap, Arkansas, to Glenwood, Arkansas, every morning to take kids to the consolidated school in Glenwood. It continues on to El Dorado and then makes an afternoon return to pick the kids up and take them home to Caddo Gap. Jim was looking through some books I have showing Rock Island motive power and saw a bug very much like the one in this article. He thought it would be the perfect motive power to haul a coach and a boxcar or two as the El & El Schoolbug. I mentioned that I just happened to have an undecorated version on hand and he decided to take it back to California and turn it into the model you see in this article. And so, fourteen years later, Jim’s article has finally appeared in the September 2018 issue of Railroad Model Craftsman. It appears without this “sidebar” piece, but with a well-deserved Dremel Kitbashing Award. One of the great rewards in this hobby has been the friendships I have made. This Doodlebug is special because it represents both my childhood and a very good railroading friend. Great article Rick!! Miss working with you and Venita on the El & El. Great article! I remmber you talking about those doodlebug rides. Miss having the El & El in the neighborhood.